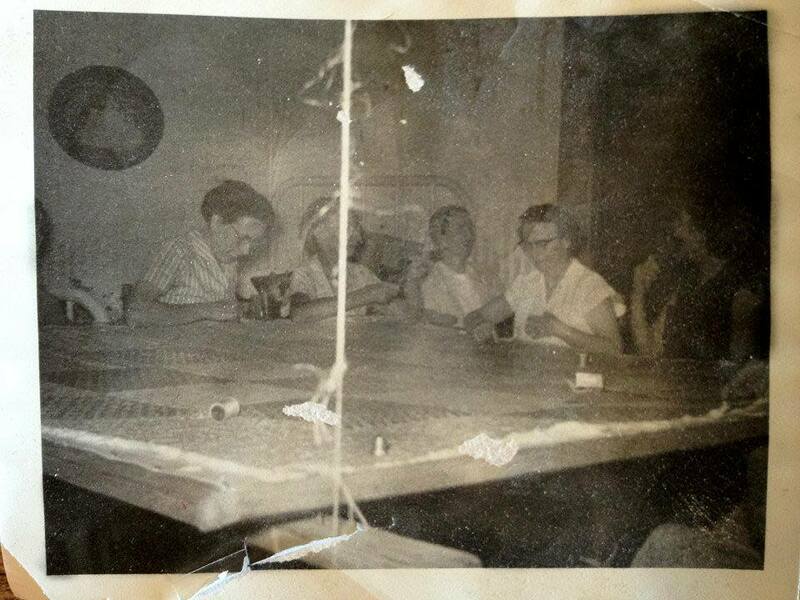 My paternal grandmother, Monnie Childress, at a quilting bee around 1960. She’s second from right. My aunt Nelwyn gave me what she believes may be this quilt. I’ll eventually take a photo and add it here. 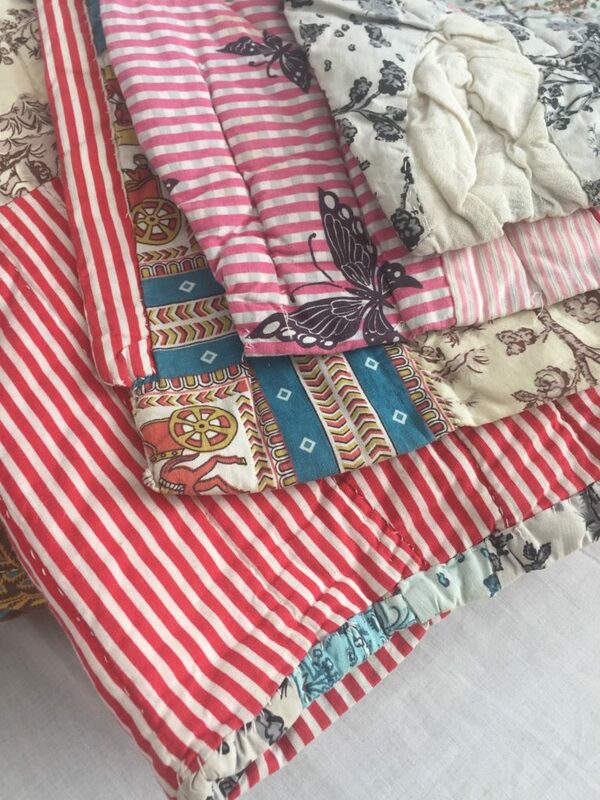 As a child, I don’t remember my grandmother quilting, but she had a stack of vintage quilts that had been made by her and relatives. By the time I came along, she was crocheting afghans. There was a big basket of crocheted squares behind a chair in her living room, that she’d eventually put together. 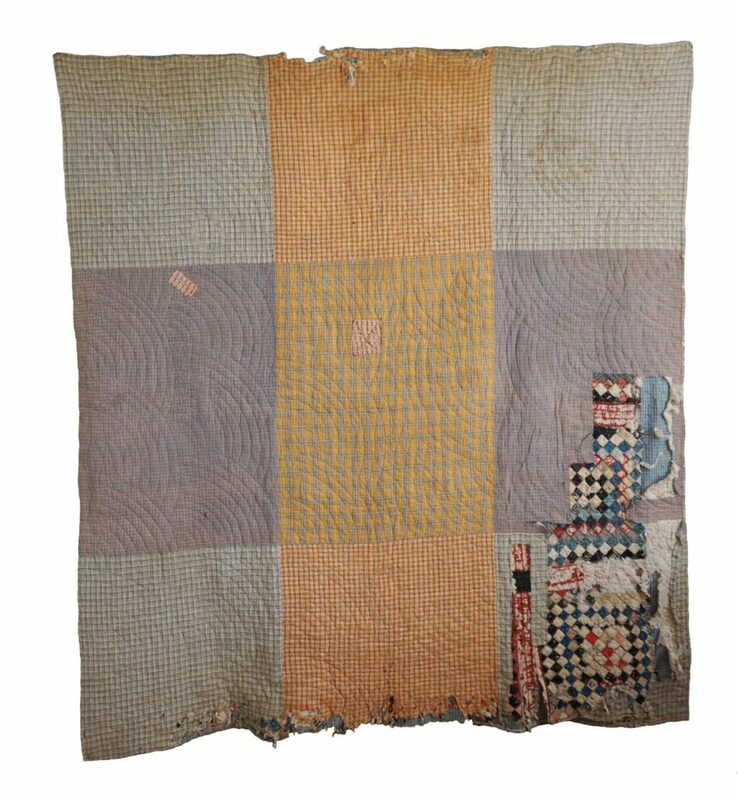 A Chattanooga, Tennessee quilt made around 1950 according to the daughter and grandson of the maker. 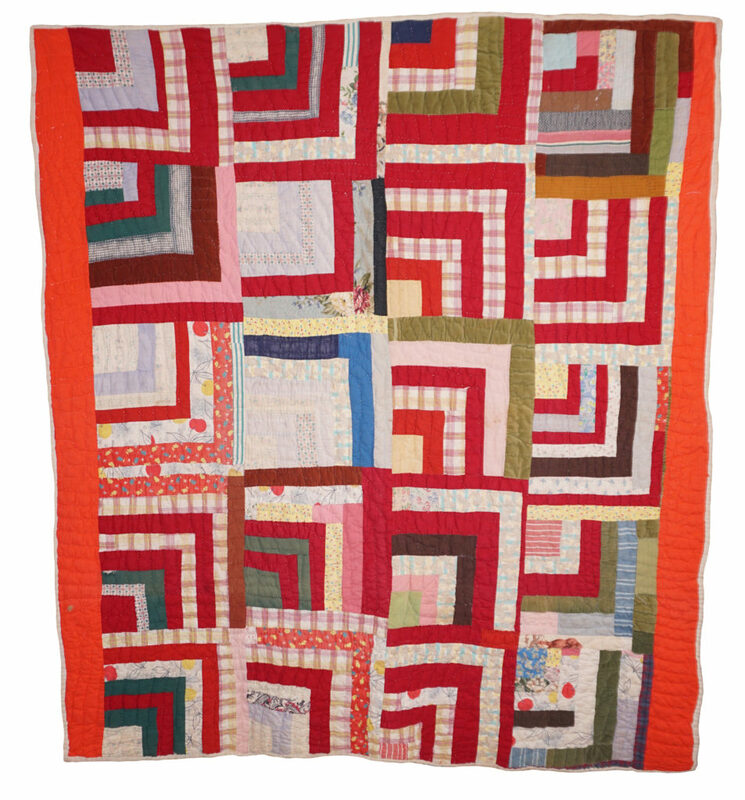 The log cabin block is a highly ubiquitous and versatile construction in quilt history. 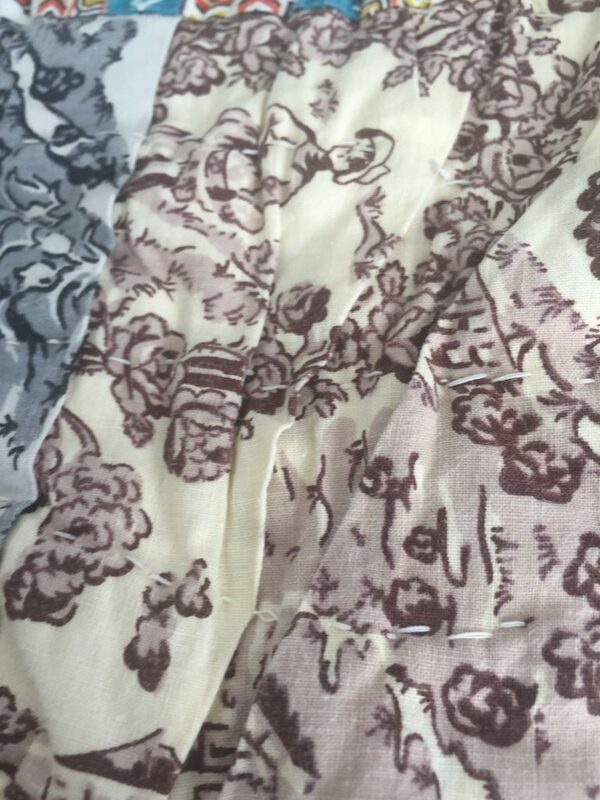 Like many patterns, how one puts together the components paired with color choice makes for wide design variety. 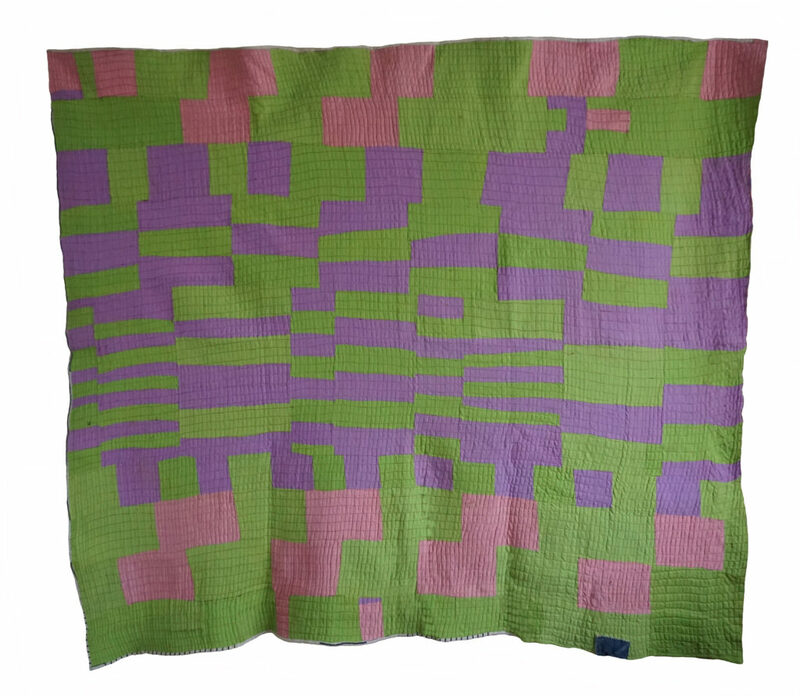 At the same time, you often find very similar quilts. 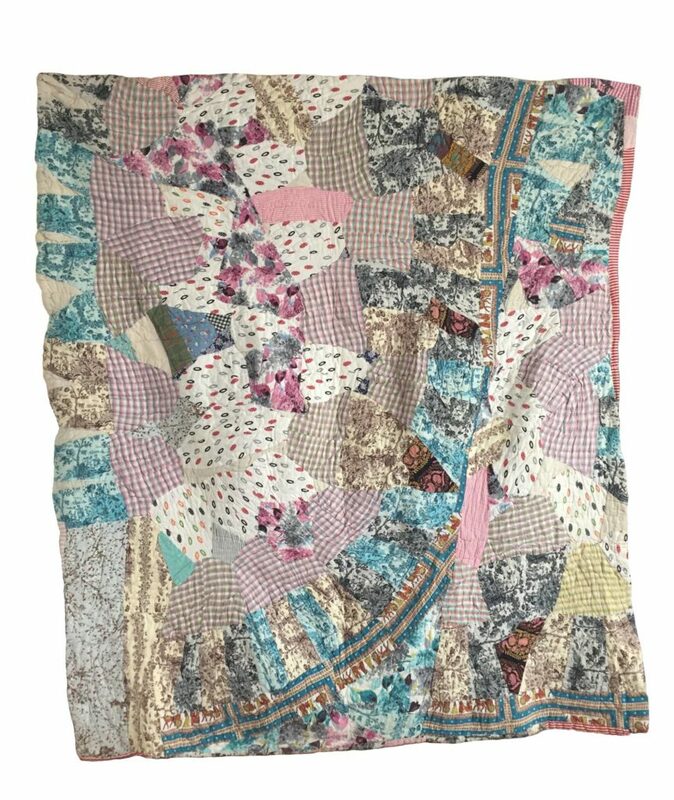 Many may think the quilt above is a one of a kind original. 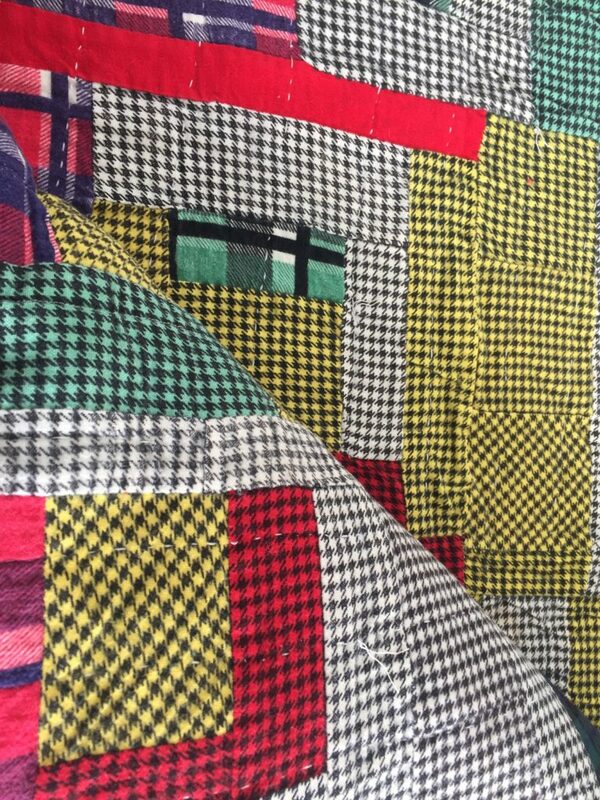 But in fact, I consider it one of a genre of log cabin quilts. 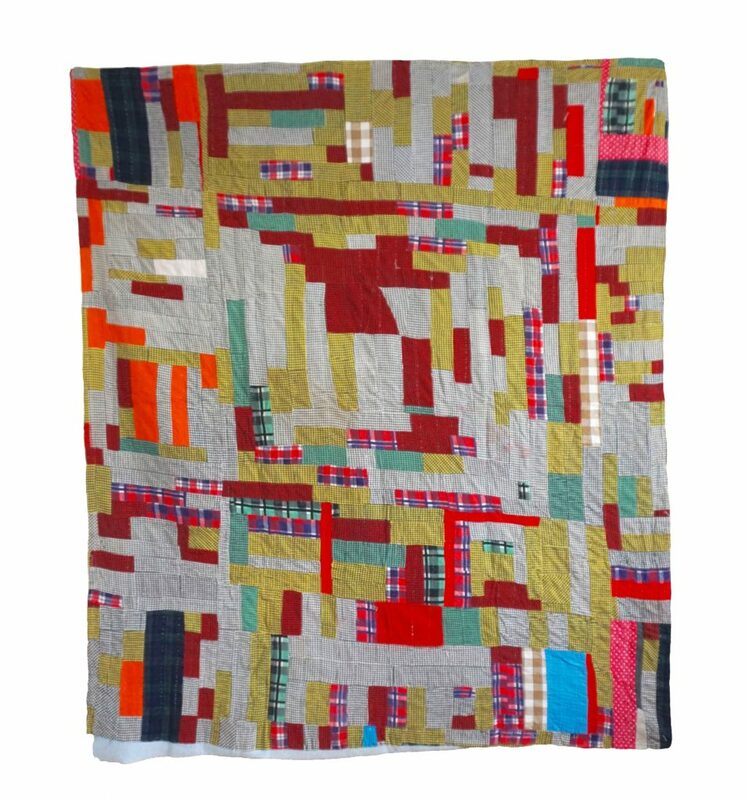 It’s a style made famous by Gee’s Bend quilters, who many–myself included–consider best of class when it comes to improvisational work. Interestingly, the Souls Grown Deep Foundation labels Gee’s Bend quilts of this nature both “Housetop” and “Log Cabin”. 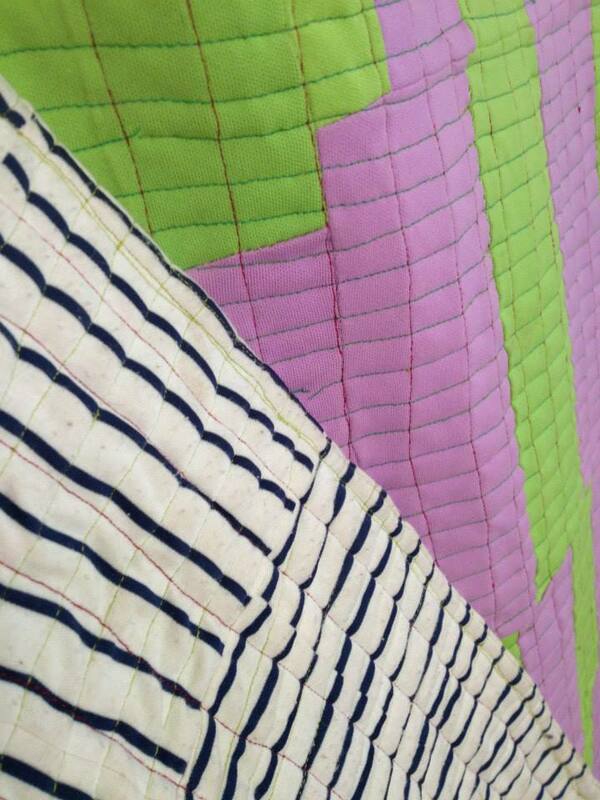 The notation they use would describe this quilt as “Housetop”– Sixteen-Block “Half-Log Cabin” Variation. 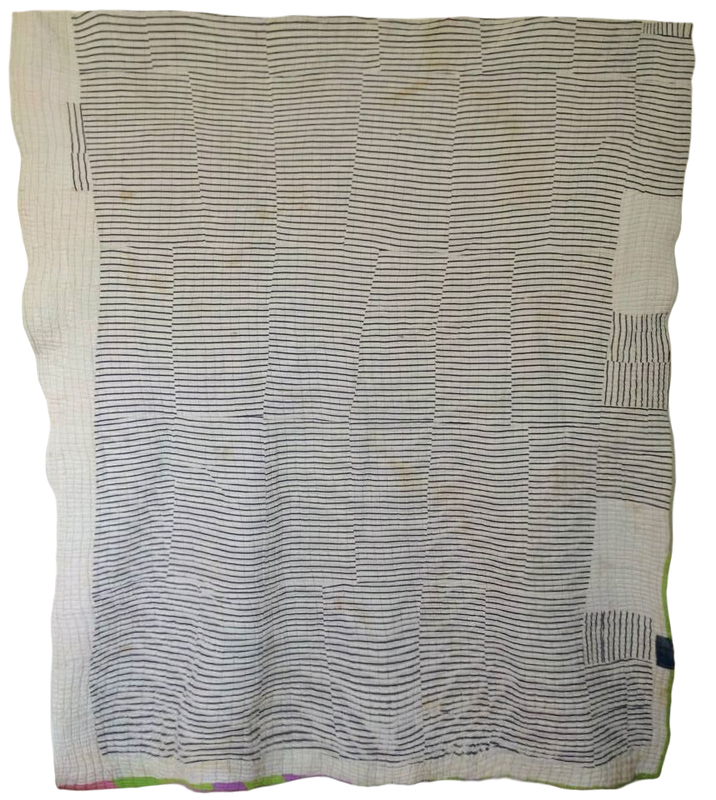 I hope to learn more about the maker of this quilt. Currently I just know her name and that it was made in Chattanooga. Some of the prints strike me as 1940s era, but the maker’s grandson labeled it 1950s. I think it could fall on either side of 1950. 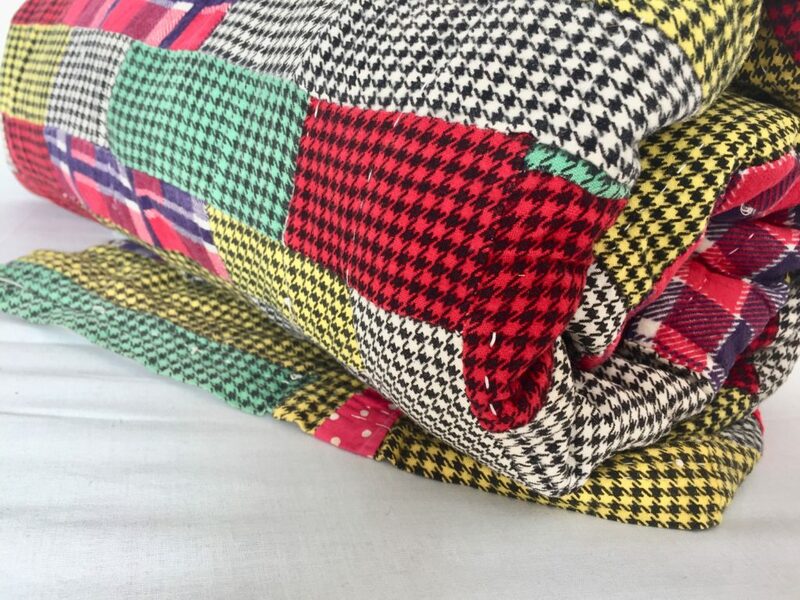 I generally refer to this as a houndstooth string quilt, because it’s predominantly composed of houndstooth prints in four colors: dark red, green, yellow and white. 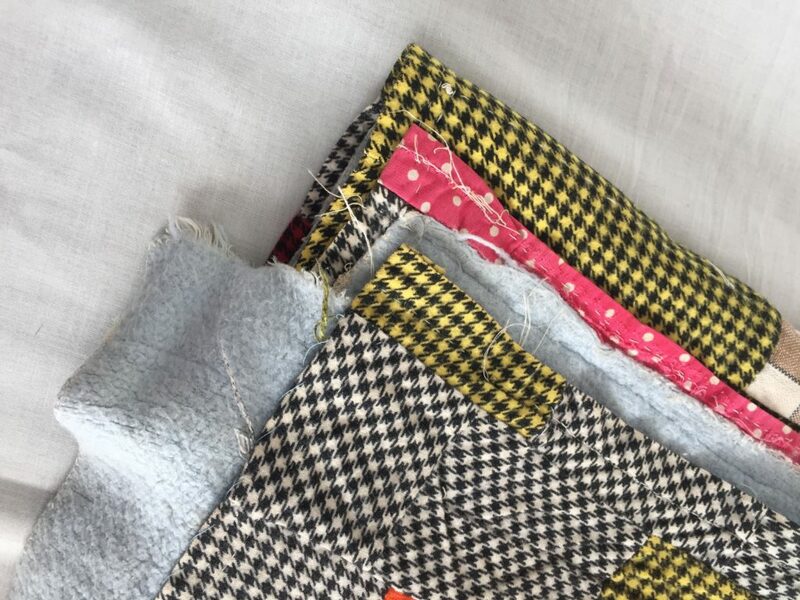 Mixed in are an orange corduroy that really makes the design pop, and some plaid and polka dots. 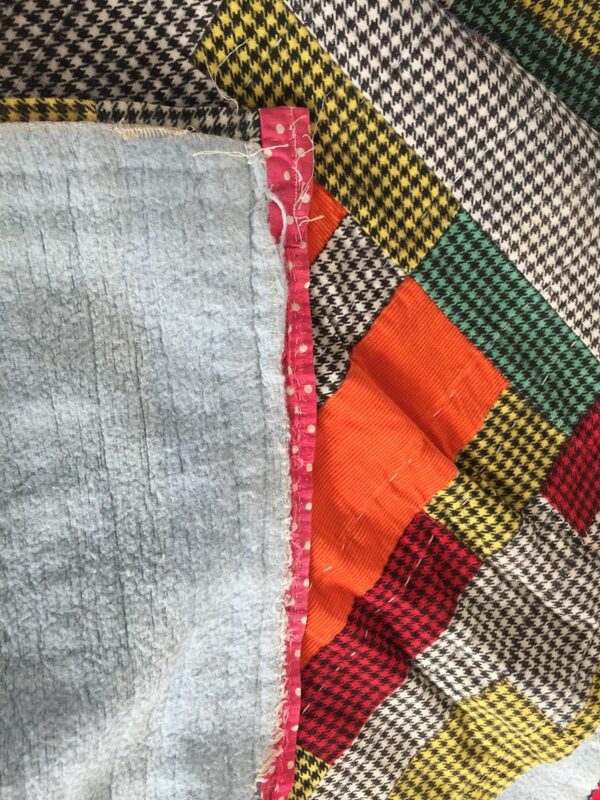 It’s the latter along with the old blue blanket on the back, patched in several places, that led me to date this piece to the 1940s. It’s very striking. And somewhat primitive. Notice the blue blanket peeking from behind at the bottom. 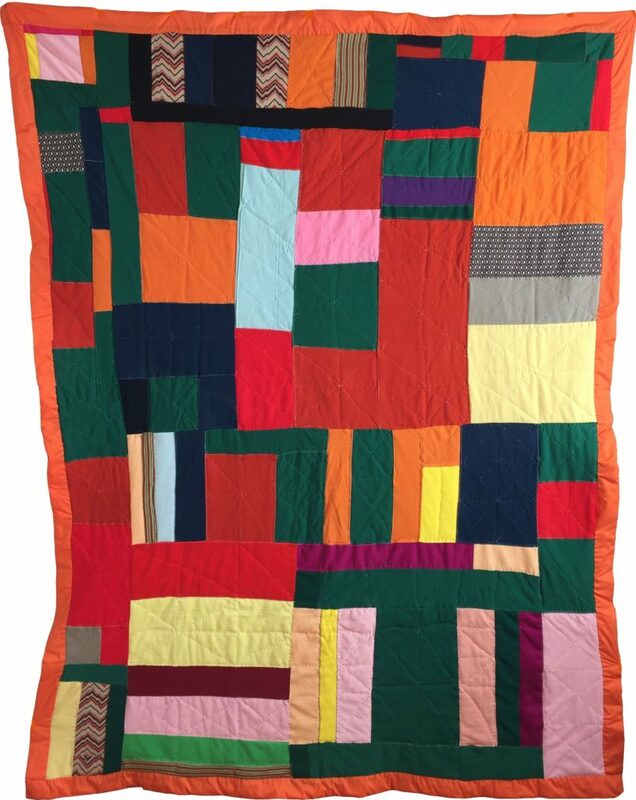 I purchased it from Roderick Kiracofe‘s collection in 2015, when I visited him in Oakland and toured his “quilt barn”. 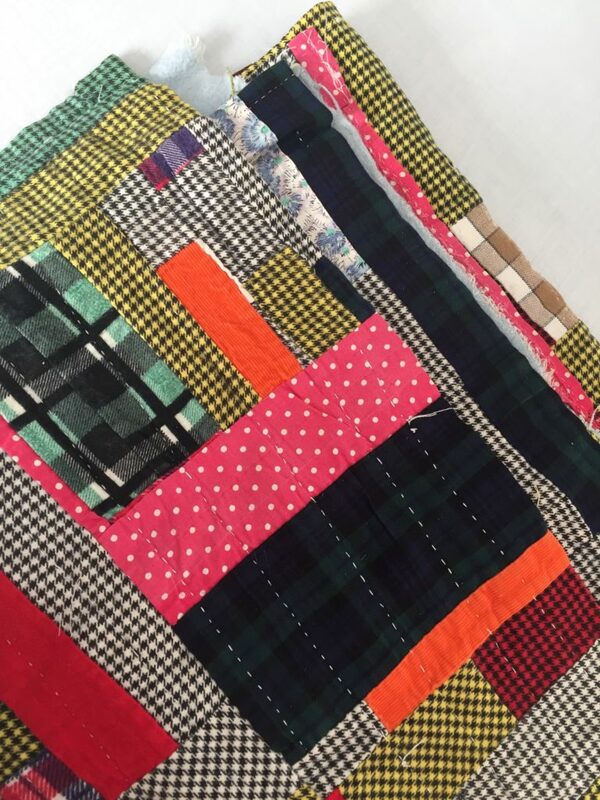 I’d say about a third of my quilt collection is circa 1970, probably about 70 quilts in all. 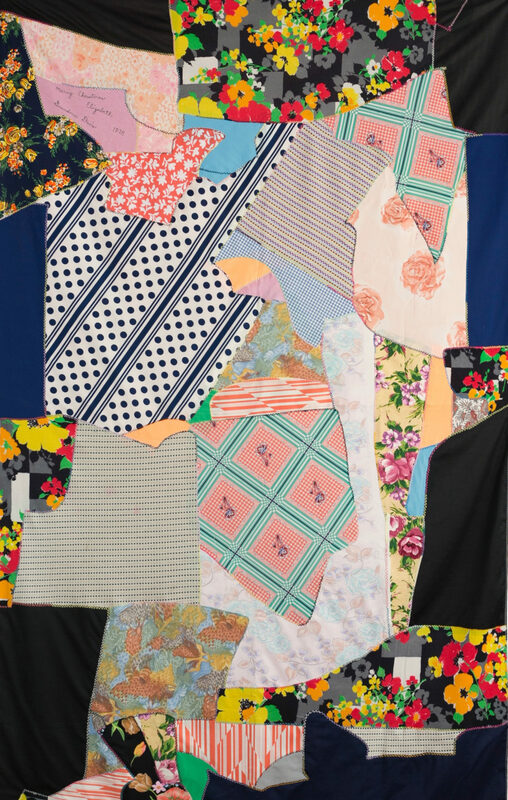 It’s a diverse collection–landscapes, appliqué samplers, rustic denim, polyester geometries, improvisational patchworks, and children’s quilts. The children’s quilts often really get me. Maybe because I was a child in the 70s. 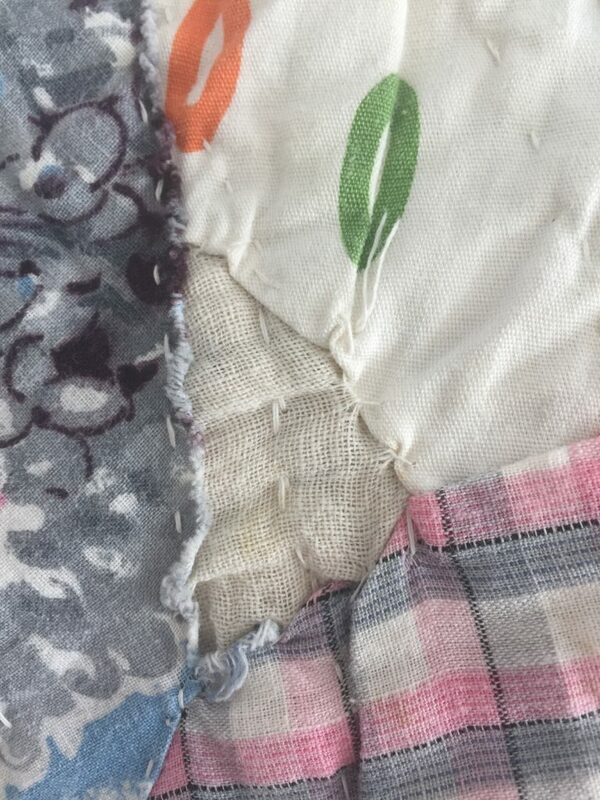 Here’s one small scale, or child’s quilt, of Humpty Dumpty. 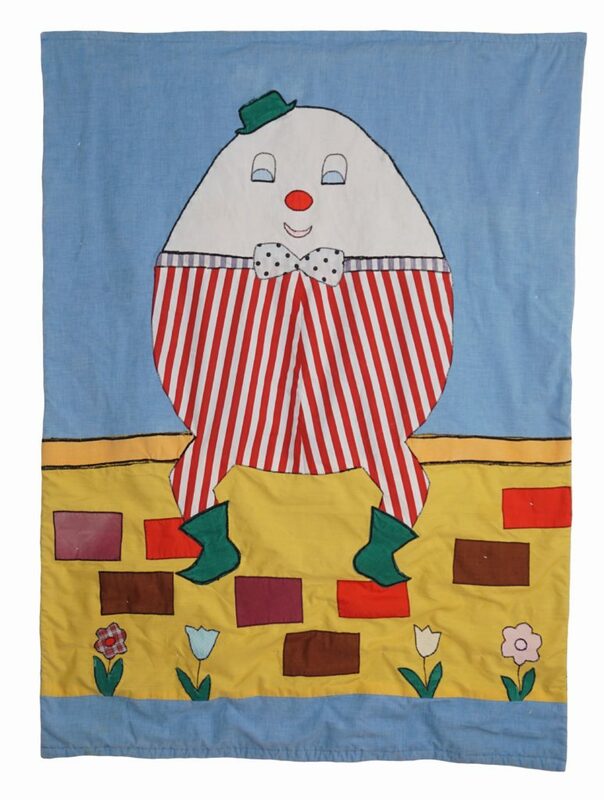 Is Humpty Dumpty still as popular today as he was in the 1970s? These women look like they’re having a grand time. 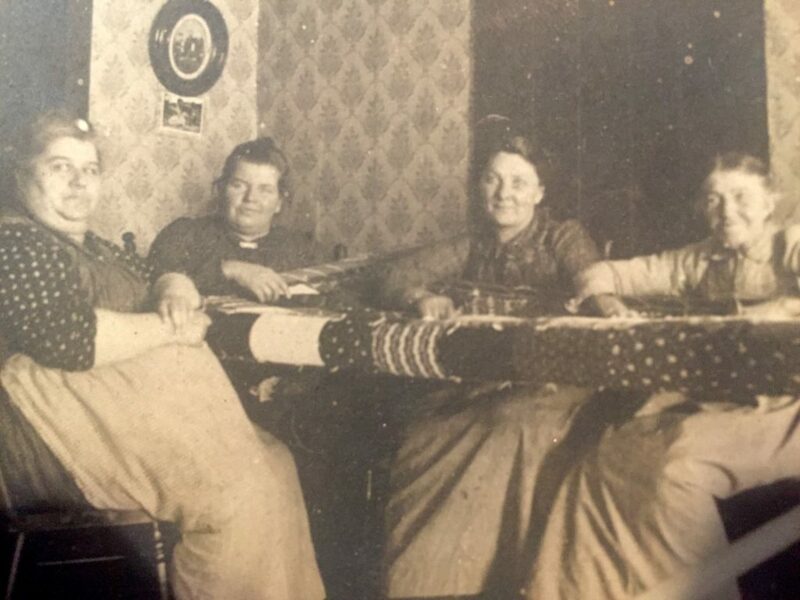 Wonder what they chatted about while working on this quilt. 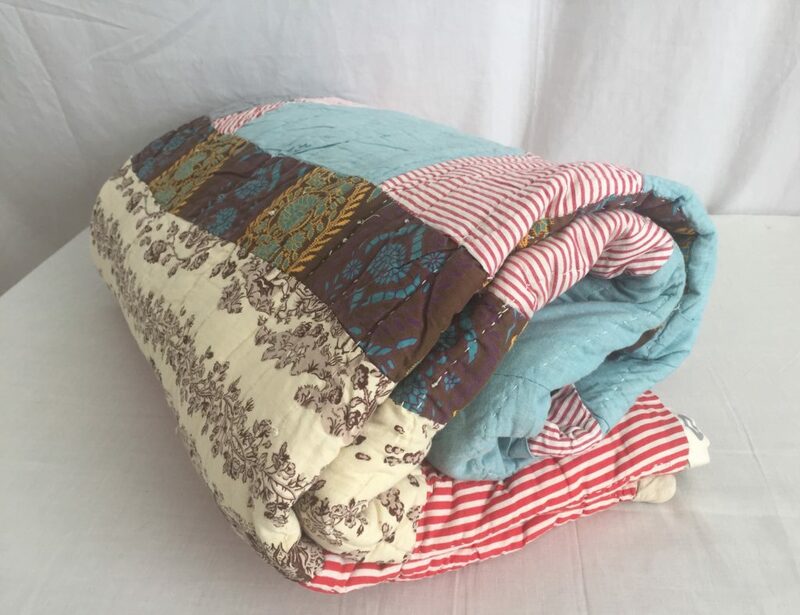 Wonder what the quilt looks like, what colors those fabrics are. Wonder who took the photograph. Was it staged? 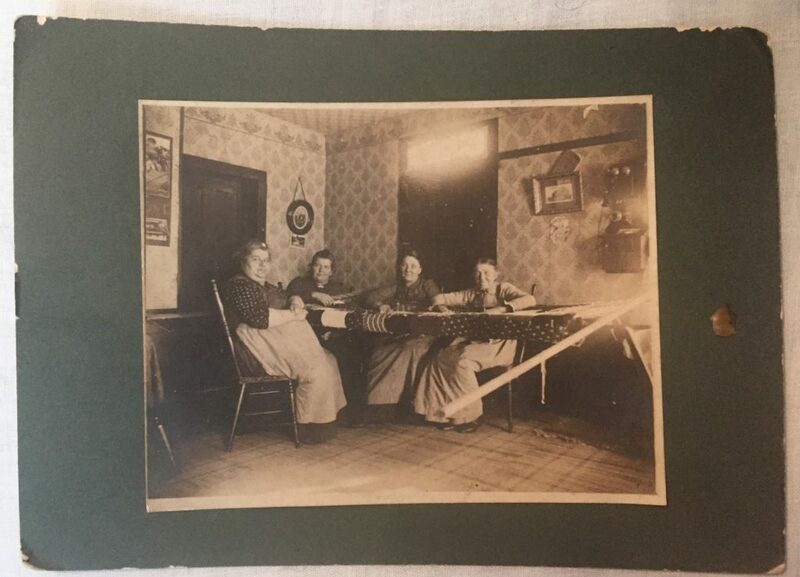 Did these women want to have a photograph taken of them working on a quilt? Here’s an image of the cabinet card the close up comes from, the two-box telephone on the wall places it around 1900. 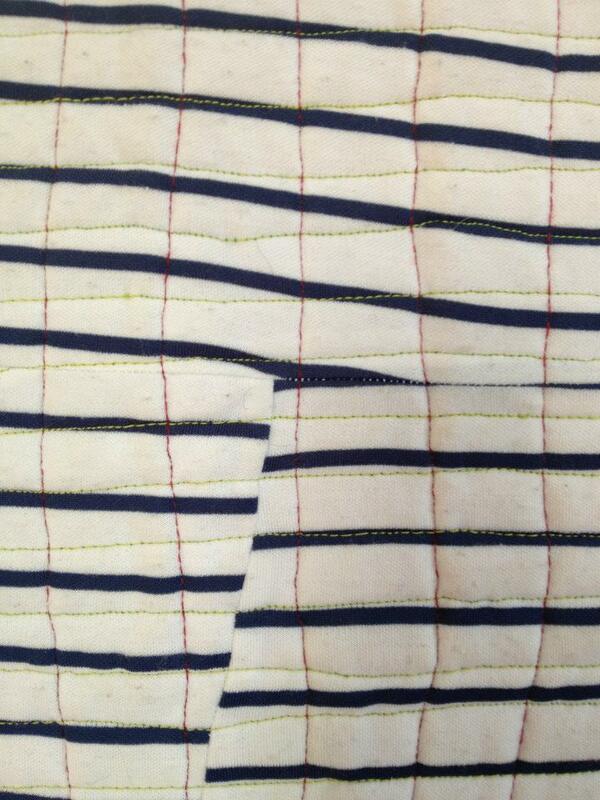 Yesterday I published a blog about an 1844 friendship, or album quilt. This block is from a 1960 version. 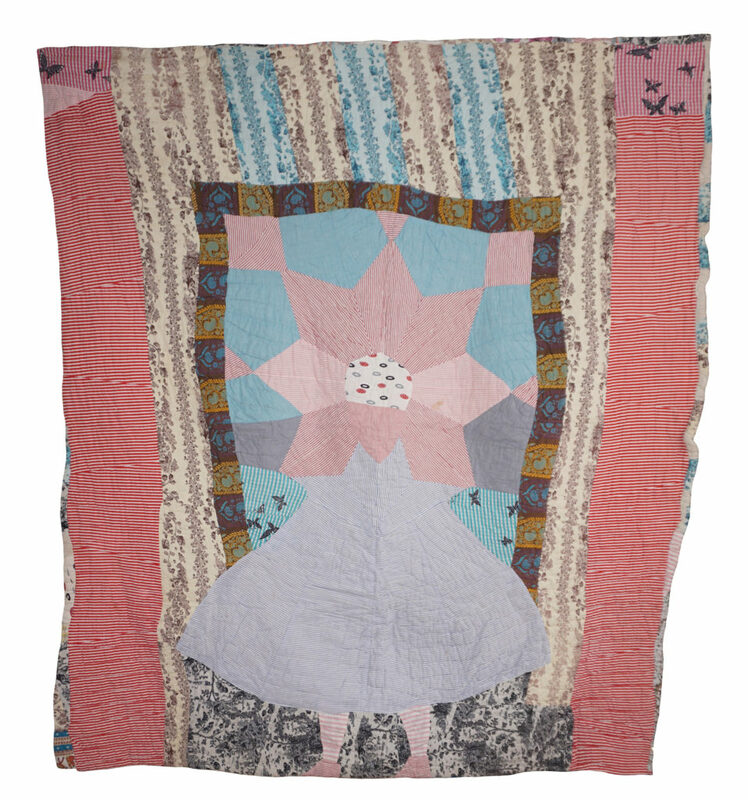 I saw the quilt on a bed in a small museum in Kelsey, Texas, where my mother grew up. This block is my family’s contribution to the quilt. My mother doesn’t know much about it, who made it or why. Her name, Ruth, is in the lower left corner. 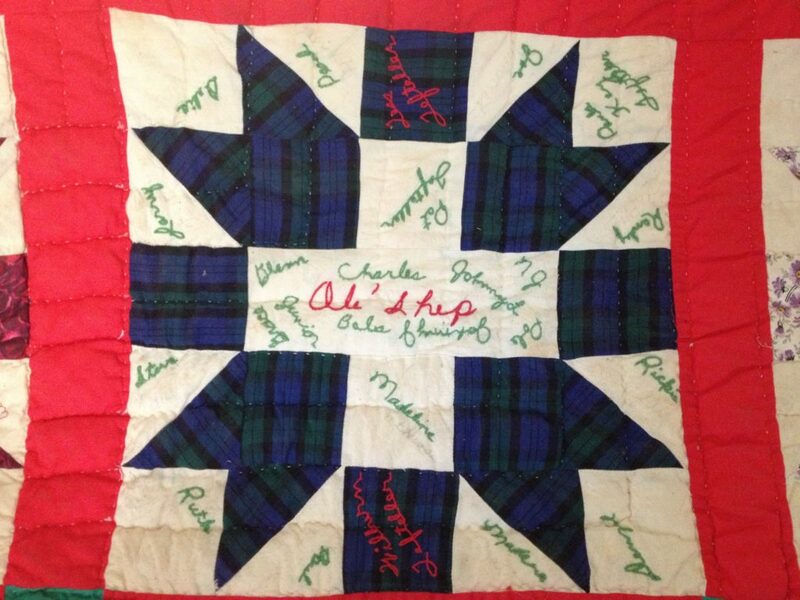 Other names are my aunts and uncles, my grandfather and grandmother are represented in red thread in the upper and lower center blocks. And Ol’ Shep? That was the dawg. Says a lot about my family that he got star treatment.